ab28664 detects RFP tagged proteins. This antibody is specific for the RFP tag. It shows very low reactivity to GFP or GFP tagged proteins. ab28664 non-specifically detects a 45 kDa protein from E. coli extracts. This non-specific cross-reactivity is not present in mammalian samples. , corresponding to amino acids 22-36 of RFP from Discosoma sea anemone. Our Abpromise guarantee covers the use of ab28664 in the following tested applications. Use at a concentration of 2 µg/ml. Block membrane in 5% milk and incubate primary and secondary antibodies in milk. 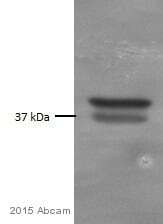 Western blot of recombinant RFP using ab28664. Immunofluorescent analysis of recombinant Red Fluorescent Protein (RFP)-transfected HeLa cells. Cells were transfected with a pCMV RFP C-Myc plasmid and 48 hours post-transfection cells were fixed with formalin and permeabilized with 0.1% Triton X-100 for 15 minutes at room temperature. Cells were blocked with 3% BSA for 15 minutes at room temperature, and then probed with ab28664 at a dilution of 1/50 for at least 1 hour at room temperature, washed with PBS, and incubated with DyLight® 488-conjugated goat anti-rabbit IgG secondary antibody at a dilution of 1/400 for 30 minutes at room temperature. Nuclei (blue) were stained with Hoechst 33342 dye. Images were taken at 20X magnification.